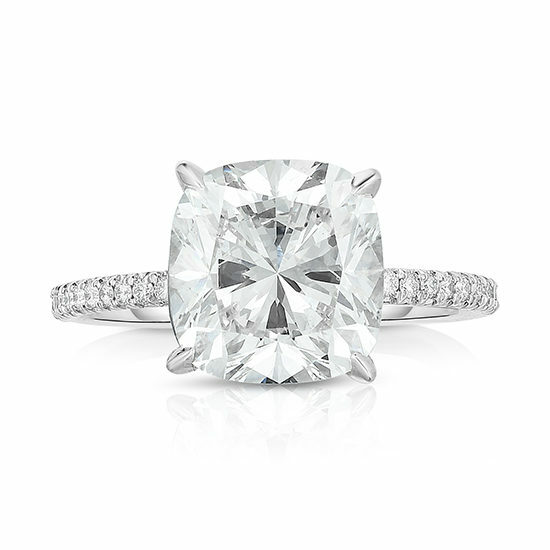 This gorgeous cushion cut diamond set in a thin platinum and diamond micro pave setting is called the Douglas Elliott Love Solitaire. It features our signature thin prongs and a refined crossbar that sits one-quarter of the way below the widest part of the diamond. This state of the art, contemporary setting is designed with an ultra thin diamond band and for the diamond to be viewed from all angles, enhancing optimal light passage and offering an elegant, minimal metal style. Shown here in platinum with a 3.02 carat I color SI1 clarity Cushion cut Diamond. Available in all stone shapes from 0.75 carats on up. This setting is meticulously sculpted in either platinum, 18k yellow gold, or 18k rose gold. Please contact us to schedule an appointment with a diamond specialist and explore the different options available to you. We look forward to creating your perfect ring.